The Butterfly Effect: Your "Everyday" Actions Can Change The World — Jeremy Height: Living Glocally. "Hi Jeremy, I know you - but you won't remember who I am." If I had a nickel for every time I have been greeted that way in my life, I would be close to being a millionaire by now. One of the results of having parents who have served at the same church and non-profit for over 20 years is: I meet a lot of people who worked alongside my family when I was only a toddler. And Alice was one such lady. Over two decades ago, Alice began serving the needy and homeless on the near-Eastside of Indianapolis and played an important role in the foundational years of Shepherd Community Center. It was during her time as a volunteer at Shepherd that my family moved into the community. I was a little smaller back then. As I talked with Alice we reminisced about people we both knew and about the old buildings the ministry used to work out of. And I also learned about people and programs which I was too young to remember. As Alice walked away at the end of our conversation, I could not shake the feeling that Alice had played an important role in who I am and the fact that my family is moving to West Africa in a few weeks. Because: Alice forever changed Shepherd due to her commitment and service in the ministries there 20 years ago. And Shepherd has forever changed and molded me (like so many others) during my time here in Indianapolis. Alice helped make Shepherd the ministry and church that it is. And I am who I am today, in large part, because of Shepherd. And my wife, son, and I are moving to Senegal and serving in unique ways there which are a result of our trainings and passions - including what we have learned during our time serving at Shepherd. It reminds me of the "butterfly effect" which in pop culture is described as the idea that: “A butterfly can flutter its wings over a flower in China and cause a hurricane in the Caribbean." More accurately, however, the theory (as described in this MIT News article) is that something as small as the flap of a butterfly's wings can effect weather patterns. Alice, like a butterfly, impacted the trajectory of countless lives (including mine) because of her consistent decision to serve the needy in downtown Indianapolis. And your story is like this too isn't it? I have no doubt that you can look back in your own life or the life of previous generations in your family and pinpoint those individuals who - through their love and service - forever impacted the trajectory of your life. For those of us who are followers of Christ, those people are very likely the ones who helped love us into the family of God. They tipped the balances and changed your life for the better because they shared the love of Jesus Christ with you in tangible ways. And the same can one day be said of you. The lives you are interacting with and the work you are investing yourself in has the ability to alter the trajectory of people's lives in the same way your life has been forever changed by others. What are you investing in this week? Is it in people and efforts that will change the lives of others? Volunteer at a local church or charity. Serve on boards for non-profits and neighborhood associations. Spend quality and quantity time with your family and friends. 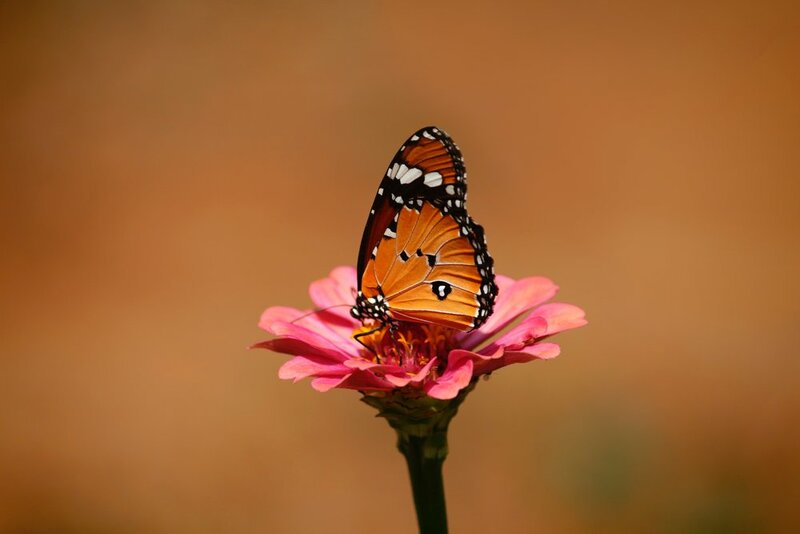 The next time you see a butterfly, remember that small choices can make big impacts in the world. In a time faced with much hate and division, it is the small choices we make everyday to share love, joy, and hope that will turn the tide of cultures and society. Sign up to receive updates on my newest articles and projects by clicking here.